The Monaco Korina was tough to prise from our hands. Something magical happens when korina gets it on with P-90s. The Monaco offers vintage sweetness in an affordable, lightweight package. The flattish fingerboard radius here might alienate some of old guard. When Fender pulled the plug on beloved electric guitar brand Hamer in 2013, it looked like the long-running American brand had taken a permanent dirt nap. Hamer was founded in Wilmette, Illinois, by four chaps: Paul Hamer, Jol Dantzig, James Walker and John Montgomery. The firm initially specialised in high-spec eye candy based on Gibson’s Flying V (the Vector) and Explorer (the Standard) models. The first Hamer production model, the Sunburst, landed in 1977 and instruments found their way into the clutches of the likes of KISS, Bad Company, Aerosmith, Def Leppard and numerous others of the rock elite. Its biggest ambassadors, however, were Rick Nielsen of Cheap Trick, with his checkerboard-finish and multi-necked models, and Billy Idol’s sideman, Steve Stevens. While all that ‘This Is Your Life’ stuff above might make for perfect bedtime reading, there’s one question we all want answered: is this Hamer reboot worthy of that illustrious headstock logo? The Korina’s mahogany neck comes spec’d with a Gibson-style 629mm (24.75-inch) scale length, a slippery 42mm wide graphite top nut, a flattish 400mm (15.75-inch) radius ebony fingerboard and 22 medium jumbo frets. The big story is the korina body and neck wood that was famously employed by Gibson for its late 50s Flying V and Explorer. If there were a tonewood fetish magazine, apart from the one you’re reading right now, korina would be in the centrefold along with the staples. What you might not know about korina is that while it’s buxom in sustain and tone, it’s also very light. Our Monaco comes in at a featherweight 2.9kg (6.6lb). As for pickups and hardware, our Monaco follows the more generic style of the Gibson Les Paul Special P-90 single-coil pickups with a three-way switch, two volumes, but just one tone. We also get a Les Paul Junior/Special-style combined bridge and tailpiece, albeit with individual saddles and intonation adjustment. One of the best necks this writer ever encountered was the fat D profile on an old USA Hamer Sunburst. The new Monaco Korina model sports more of a medium C shape that reminds us of the PRS SE ‘Wide Fat’ feel. Anyway, we like the new Hamer shape. Combined with the big frets, shredder-friendly fingerboard radius and the low action, this is one of the most comfortable guitar to play you’ll find anywhere. Upper fret access is boss, too; just look how deep those cutaways are. The Monaco Korina is everything you’d expect from a great P-90 guitar. The bridge pickup sparkles with a clean tone and some reverb but goes all Jekyll and Hyde when you wind up the overdrive. Think Johnny Thunders of the New York Dolls. Flicking to the middle position introduces a warm woody element to the tone, while running the neck P-90 solo is where you need to be for your tasteful blues stuff. At this price, we’d be tempted to mod the Monaco with a couple of Lollar jobs or some of Bare Knuckles’ finest. After a fair bit of interaction, however, we really enjoyed hanging out with these stock pickups. No matter what position you play in, or what level you run your overdrive/ distortion at, you can always hear the guitar’s underlying character. So, were we visited by the ghost of riffage past? 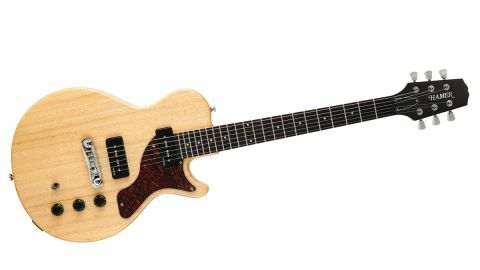 Yes, the spirit of the original Hamer classics haunts this new model. You’re getting some tasty tonewood for your money, and the build quality and playability is as good as anything you’ll find for less than 700 sheets. The Monaco Korina was tough to prise from our hands. Yes, the build quality is great, but it’s the lightness on the strap and sweet tones released by the twin P-90s that made it so distressing to put it back in its box. Given its layout and price tag, we can’t think of another similarly spec’d guitar that made us so happy. It’s a real contender. The bottom line is it’s great to see Hamer back in business.